A small vigorous variety with unusual blue green pinnate leaves and large clusters of pink tinged flowers in spring followed by pink berries and autumn foliage of orange and red. Mountain Ash is from the genus Sorbus and Pink Pagoda is a particularly pretty variety of the several small trees that belong to that family. There are varied names for this stunning hardy little plant, for example Sorbus pseudohupehensis, Chinese mountain ash or Hubei Rowan, as it was discovered in Hubei province of China, and it is native to western and central China. Mountain Ash Pink Pagoda is a deciduous small tree which will grow to a height of 15-20 feet so perfect for any garden be it large or small. The blue-green pinnate foliage in spring and summer of this delightful tree which turn to orange and red in autumn are a perfect background for the pink tinged flowers that appear in spring followed by stunning large bunches of persistent and very colourful pink berries. The flowers are a great attraction for insects in spring for pollination and the berries which can be held through the winter months even when the leaves have fallen are a favourite for birds. As Mountain Ash Pink Pagoda is a hardy specimen it will suit most sites in full sun or partial shade even in exposed areas. It will cope well in any reasonable well-drained soil, growing to approximately 15-20 feet at most. 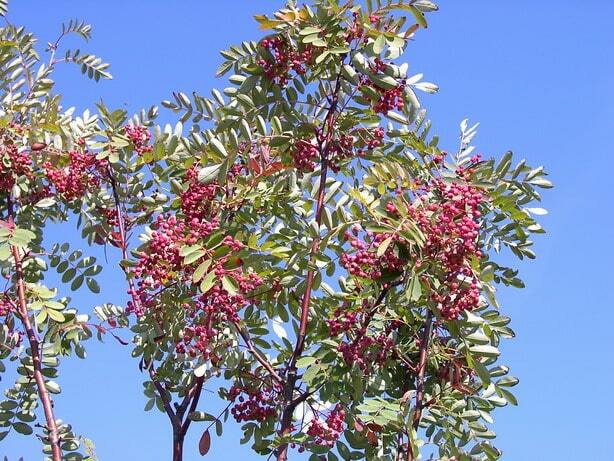 Sorbus pseudohupehensis Pink Pagoda is supplied as either bare root plants in the correct season from November until March which is a more economical way of purchasing or as larger pot grown plants throughout the year if you want something a little more established. If you have any queries regarding Mountain Ash Pink Pagoda please phone one of our team and we will be happy to answer any of your questions.